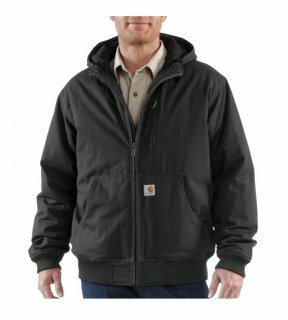 Lighter in weight yet strong, this active jacket helps you pull your weight throughout a long work day. It's built of Quick Duck™ with a durable water-repellent finish that's 30% lighter yet ounce-for-ounce as durable as the legendary Carhartt® sandstone duck. Nylon lining quilted to mid-weight polyester insulation provides warmth, and a pull-up quilt-lined hood with draw-cord closure adds protection whenever needed. Carry a lot of items? This active jacket is well outfitted with a left-chest map pocket, two large lower-front pockets, and two inside pockets - including one with a media port to let you string a headphone wire to a cell phone or media player. Rib knit cuffs and waistband help seal in the warmth, and triple stitched main seams add strength.